Science says salad without oil simply isn’t as good for you. Recently I've taken to eating raw baby spinach by the fistful. And not without a certain amount of smug pride. I actually like the juicy, bitter flavour profile of a cheekful of unseasoned greens — but I was certain that fresh crudite in its most crude form was a categorical health win. I was wrong, dear reader, so wrong. As was Popeye. 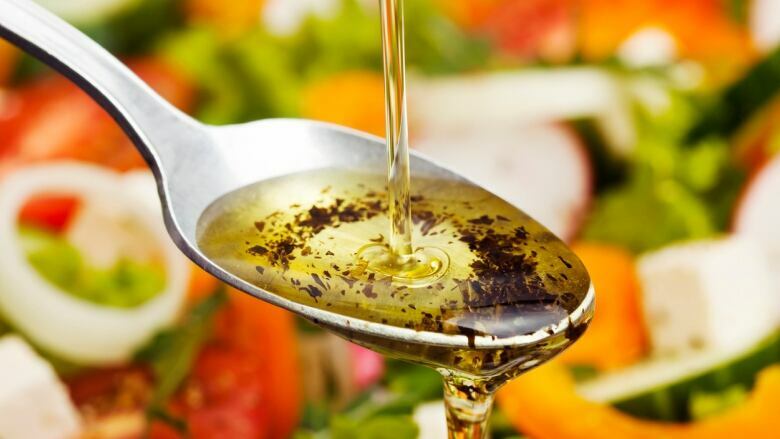 A recent study showed that enjoying your standard salad with some added fat delivered in the form of soybean oil (common in many store-bought vinaigrettes) significantly enhanced the absorption of numerous beneficial veggie micronutrients. Dr. Wendy White, Associate Professor of Food Science and Human Nutrition at Iowa State University, led her team to find that at least seven different micronutrients become far more bioavailable to us with a little fat. For the curious among you, those nutrients are alpha and beta carotene (found in carrots and spinach), lycopene (found in tomatoes), lutein (found in leafy greens), vitamin E (found in oils and nut fats), vitamin K (also found in leafy greens like kale) and Vitamin A (found again in carrots and red pepper). All things your body needs for optimal health. In fact, White confirms that some of the health benefits of the above include useful boosts to your body's ability to prevent cancer and preserve eyesight. So, handy. The study, which recently appeared in the peer-reviewed American Journal of Clinical Nutrition, had 12 women (all college-aged) consume copious amounts of salads mixed with varying volumes of soybean oil, then undergo blood tests that scanned for nutrient absorption. No info was given on whether they were laughing at the time of salad consumption or if a stock image photographer was on site. Consider that men and women metabolize the relevant nutrients at different rates, so women were chosen specifically for this trial. Regardless, the findings (although centered around vegetables) were fruitful. So beneficial was a little fat with your bowl of preferred salad veggies that nutrient absorption was found to be directly proportional to the amount of oil used. Yes, more oil meant more micronutrients. White confirms, "the best way to explain it would be to say that adding twice the amount of salad dressing leads to twice the nutrient absorption." What's more, White's team found that the exact same salad sans added oil significantly lowered the body's ability to absorb a comparable nutrient load. No dressing translated to less nutritional benefit. Something to keep in mind if your kids (or you) are struggling through a bowl of greens or broccoli. Bring on that flavourful fat hat. Still, before you and your family start chugging sesame ginger vinaigrette spinach smoothies (although… yum, maybe) note that White is adamant the daily recommended dietary amount of two to three tablespoons of oil or fat still stands. Just be sure to have your spoonfuls with salad veggies. While some subjects benefitted from more or less absorption, results showed that maximal nutritional absorption maxed out at about 32 grams of oil (the highest amount studied) or just over two tablespoons. That's your sweet (oily) spot. "For most people, the oil is going to benefit nutrient absorption," she said. "The average trend, which was statistically significant, was for increased absorption." So, do take your greens with a healthy side of fat and leave the naked leafy greens to Popeye (and other fictitious heroic strong men). Wait, Popeye was married to Olive Oil. Sweet. Harvard science says chocolate is still good for the heart.